Selterhof, a former military site covering 45 hectares, was used for 40 years until 1994 as a telecommunications centre and depot. 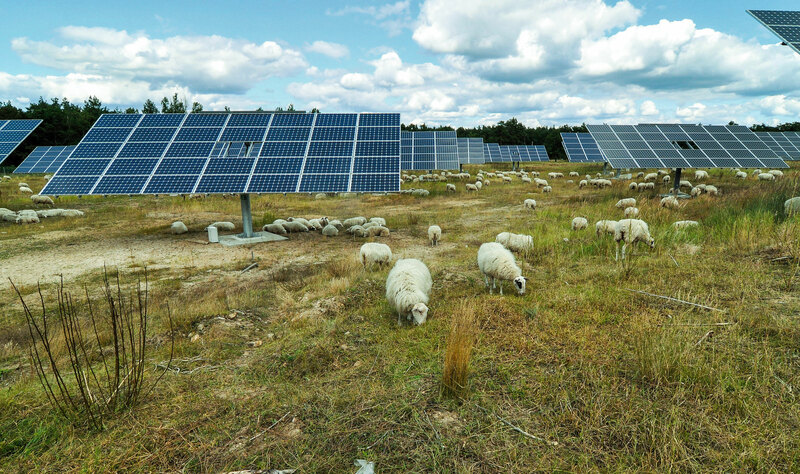 Before Energiequelle GmbH was able to build a solar farm on the site, its first task was to dismantle 85 buildings and a fuelling station and restore the area to its original natural state in an ecofriendly way. Construction of the solar farm began in 2008. A total of 9844 photovoltaic modules mounted on 284 trackers now produce a total power capacity of 2.25 MWp. Annual output thus amounts to 2748 MWh, enough to cover the annual power requirements of around 600 four-person households. Every form of energy that exists on earth, with the exception of geothermal energy and tidal energy, is ultimately owed to the heavenly body at the centre of our solar system – the sun. Each year, the total amount of energy it shines on the Earth is the sheer unimaginable figure of approx. 108 trillion megawatt hours (1.08 x 1012 MWh). Global primary energy consumption in 2008 was approximately 120 million megawatt hours. In other words, year for year, the sun supplies the planet with almost 10,000 times the amount of global primary energy needs, or: every eight minutes, the power station known as the sun sends us as much energy as all of humanity consumes in one year, without sending us a bill. And it will do so for billions more years. If humankind could succeed in harnessing only a fraction of that energy, energy worries would be a thing of the past. Solar power plants convert the direct and diffuse sunlight hitting the earth into heat and/or electrical power. Photovoltaics allow the direct conversion of sunlight to electric energy. This is made possible by the photoelectric effect first described by Albert Einstein, and for which he was awarded the Nobel Prize for Physics in 1922. Today’s photovoltaic systems use two key technologies: the first is ‘thin-film technology’, in which cadmium telluride (CdTE) or copper-indium-selenide (CIS), for example, is deposited in ultrathin layers on glass plates; the second is silicon technology. The basic material for the latter is silicon, the second most common element on earth after oxygen. Silicon technology literally enables us to generate electricity from sand. 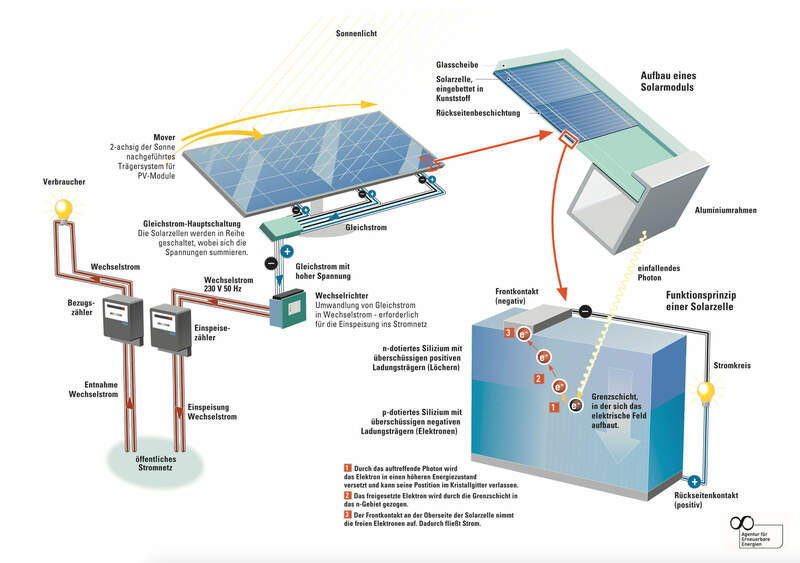 In the south of Germany, the sun supplies around 1,150 kWh/m2 per annum on average. In the Berlin/Brandenburg region, the figure is about 1,000 kWh/m2, and approx. 950 kWh/m2 at the coast. Although these values do not exactly make our country one of the sun-kissed areas of the world, it is still possible to harness the sun here to generate considerable amounts of electrical power and heat. In 2009, around 6,200 GWh of power were produced with the aid of photovoltaics, equivalent to around 1.04 per cent of total power consumption in Germany, but with an upward growth rate. In the same year, photovoltaics were responsible for saving around 3.9 million tonnes in greenhouse gas emissions (CO2 equivalents).